I loved watching Garfield and Odie when I was growing up! Even though I'm a dog person, I have always wanted to have Garfield as a pet. I love fat, lazy cats. Now that I'm a parent, I get to enjoy the adventures of Garfield and Odie with my children. I love watching them enjoy the same things as I did as a kid, brings back great memories of my childhood. Garfield and Odie just happen to be the mascots of our local Theme Park, and the kids love getting their photos taken with them each summer. It bittersweet to see how much my kids and grown and changed from one summer to the next. It’s one adventure after another as Garfield and his pals look for a pot of gold at the end of a rainbow, try to save their favorite pizza place and morph into superheroes! Then hold on and get ready for one wild ride as they visit Cheese World, a cheese-lover’s theme park! But will Jon rain on the summer fun when he enrolls Garfield in an extreme education program to become a “normal” cat? Not if Garfield can help it! The DVD includes six new episodes: "Perfect Pizza", "Lucky Charm", "Extreme Housebreaking", "Mailman Blues", "It's A Cheese World", and "Super Me." 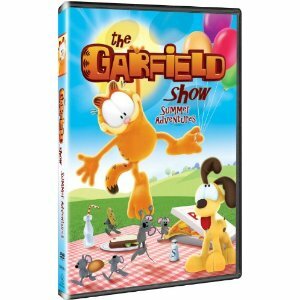 Disclaimer: I received a complimentary The Garfield Show: Summer Adventures DVD for the purpose of writing a review and hosting a giveaway. Regardless, I only recommend products or services I use personally and/or believe will be a good fit for my readers. The views and opinions expressed on this blog are purely my own. Results may vary. No monetary compensation was received. Garfield. 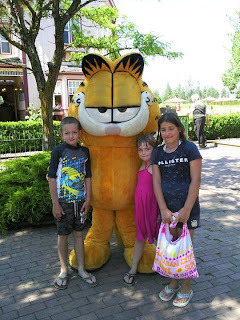 My son loved Garfield when he was younger and we collected everything we could find that had to do with Garfield. He's 35 years old and I think he still has it. I love Odie. He's just so cute and loveable.My 2 neices will love watching this,and it'll bring back memories of when I watched when my daughter was little. Thanks so much for the giveaway! I honestly love ODIE.. I think he is so cute. I love Garfield. :) Thanks.